More satirical cartography in this MapCarte entry because maps are extremely powerful objects with which to convey a message designed to be politically charged or even propagandist. Here, James Gillray creates a caricature of England and its relationship with the rest of Europe, in particular showing disgust at nearest neighbours, France. The map was created in 1793 amidst murmurings of impending French invasion as part of their wider revolutionary tendencies. How best to create a fervently patriotic show of distaste for invasion that is sure to increase sympathies to the ruling King and anti-French sentiment? Use a map! 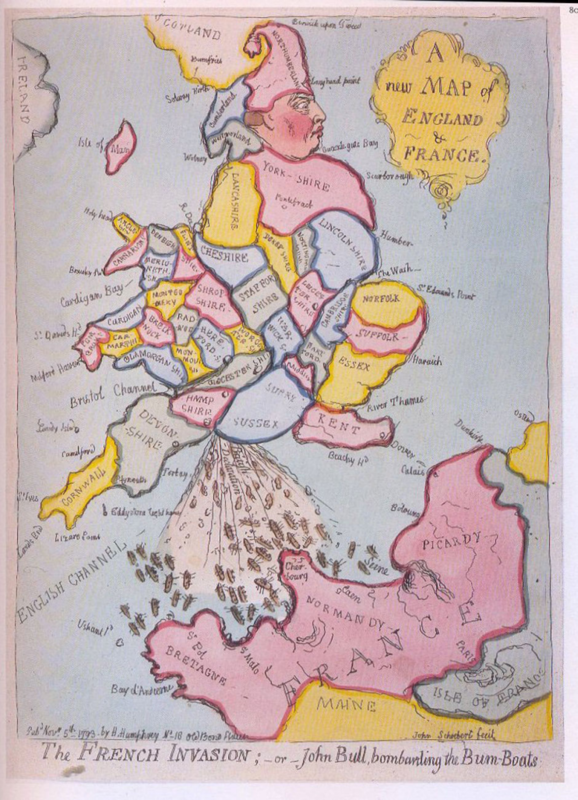 Gillray fits the shape of John Bull into the England and Wales. Bull, of course, is the stereotypical personification of England: a witty, jovial, stout matter-of-fact man. The French invasion of bum-boats is repelled by the defecating Bull from the ports of his ‘south coast’. Even the French coastline is configured to look like a face with the stream of muck being thrown unceremoniously straight into the face itself. Gillray was a master of satirical caricatures and a commentator on political and social issues. This work captures the strength of feeling declared by King George III against the potential of a French invasion. Cartography as a vehicle for satire and commentary is indeed a powerful mechanism in the hands of a skilled craftsmen and although the sketch is merely that – a sketch rather than an accurate portrayal of topography – it needs no more than a general shape on which to hang the message. This entry was posted in Uncategorized and tagged historical, MapCarte, satire by @kennethfield. Bookmark the permalink.